Boost productivity by bathing several compatible pets at the same time. Our heavy duty, chew resistant cable tie-out allows complete control of up to three dogs or cats at once to maximum the potential of your bathing facilities. Use in pet tubs, bath tubs or on grooming arms. 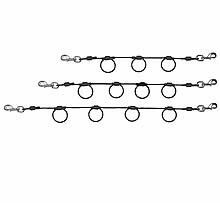 Hook to a grooming arm to give you several lengths to hook your grooming loop to or add to your pet tub by clipping it on the left eyelet to the right eyelet to give you more options to hook your grooming loops to. Suction Cups for the tie out cable sold separately.